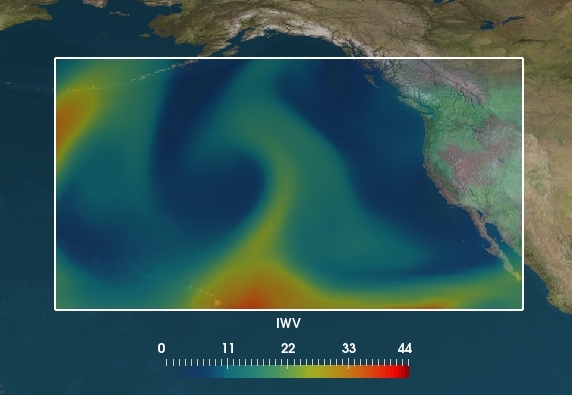 Can you detect an Atmospheric River? This post is jointly completed by Dr Vitaliy Kurlin and his new student Grzegorz Muszynski, who has started a PhD on “Topological Analysis of the Climate System” at University of Liverpool in April 2017 funded by Intel through the Big Data Centre at the Lawrence Berkeley lab (US). 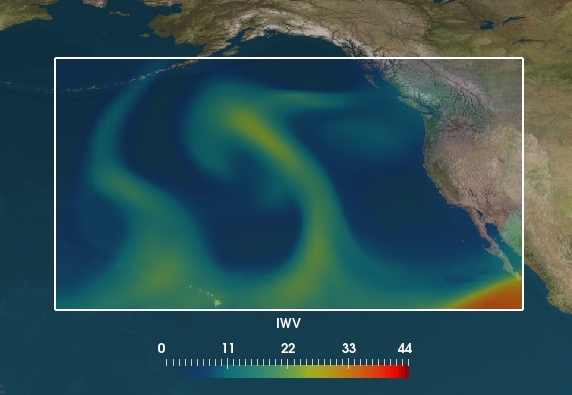 Why are Atmospheric Rivers important? 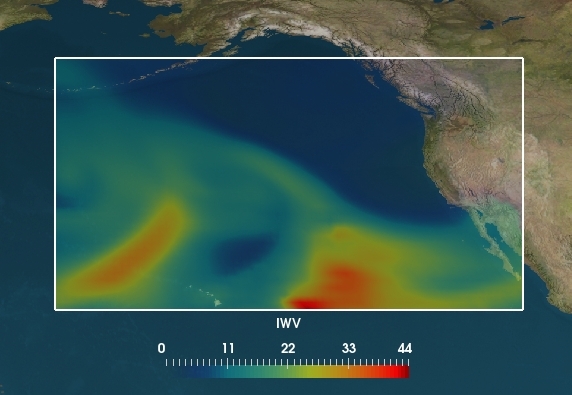 How are Atmospheric Rivers detected? 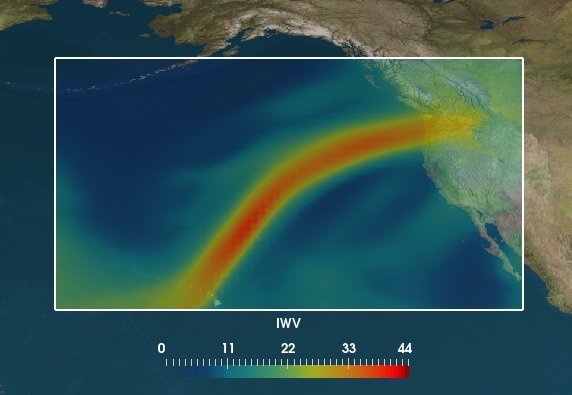 An Atmospheric River (AR) is a narrow filament of concentrated water vapour in the atmosphere, usually up to several thousand kilometers long and a few hundred kilometers wide. These filaments were called Atmospheric Rivers in the paper “Atmospheric rivers and bombs” (pdf) in 1994, because a single filament can carry more water than the Amazon River. Hence an Atmospheric River can be informally considered as a “river” flowing in the atmosphere. The picture above shows the integrated water vapour (IWV) measured in grams over a squared millimetre, formally the mass of water in the vertical column over a square 1×1 mm. Higher values of IWV correspond to the red colour, lower values are shown by the blue colour. 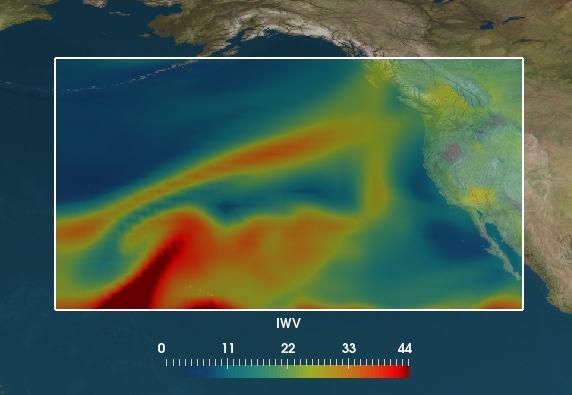 The red box from the picture above is zoomed in the picture below showing how an Atmospheric River hits the California coast in the US. At any given moment there are 3-5 Atmospheric Rivers on the planet and all of them contribute over 90% to the global north-south water vapour transport. When an Atmospheric River hits a coast, this “river” flows down to the land as heavy rain, which causes severe floods. These extreme weather events regularly happen along the West Coast of North America, Western Europe and the west coast of North Africa, e.g. read “Rivers in the Sky Are Flooding The World With Tropical Waters” (pdf). The paper “Winter floods in Britain are connected to atmospheric rivers” (pdf) justifies that all winter floods in the UK in 2000-2010 were caused by Atmospheric Rivers including the 19th November 2009 severe flood on the River Eden in Cumbria (UK). The input for a detection is a scalar field of the Integrated Water Vapour (IWV) over a regular grid whose lines are usually parallel to meridians and longitudes. The input can be visualised as a matrix of IWV values that are obtained from weather observations or computer simulations. So every node in the regular grid has an associated value of the Integrated Water Vapour and is connected to the four neighbours (north, west, south, east) in the grid. High moisture regions that bring water vapour from mid-latitudes in the ocean up to the land in the north are called Atmospheric Rivers to distinguish them from other high moisture regions that don’t cause floods. 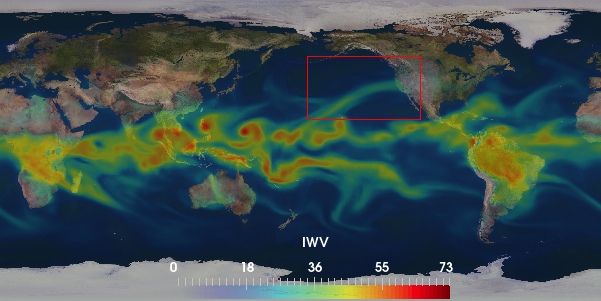 A detection algorithm should identify only Atmospheric Rivers. The picture above shows a big hole in the yellow-red region that doesn’t form an elongated filament. The picture below contains the yellow high moisture region without holes, but this filament doesn’t reach the coast. Hence there are no Atmospheric Rivers in both cases. The traditional approach to detect an Atmospheric River is to fix a threshold of the Integrated Water Vapour, say 20 g/mm2, and consider all nodes with values above this threshold. If these nodes form a connected component in the regular grid that has expected geometric parameters (length and width) and also joins the mid-latitude region (the bottom line of the chosen box) with the California coast, the latest detection algorithm in the TECA software (Toolkit for Extreme Climate Analysis, pdf) says that an Atmospheric River is detected. The state-of-the-art algorithms work only for carefully chosen parameter values. Many Climate Scientists propose different values. That is why we are now working on a parameterless approach combining ideas of Topological Data Analysis with Machine Learning. Which of the pictures below show Atmospheric Rivers in your opinion and why? You could write a brief answer or feedback in your comment: reply. This entry was posted in introduction on April 22, 2017 by Vitaliy Kurlin. Dear Prashant, thank you for your correct answers. Kind regards, Vitaliy. Please do more blog posts! Dear Janet, thank you for your helpful encouragement! Vitaliy. Dear Aviral, thank you for your brief and correct answers. Since the first correct answers were submitted already 1.5 years ago, we probably need more questions to keep the interest of readers. Thanks, Vitaliy. What is topological data analysis about? 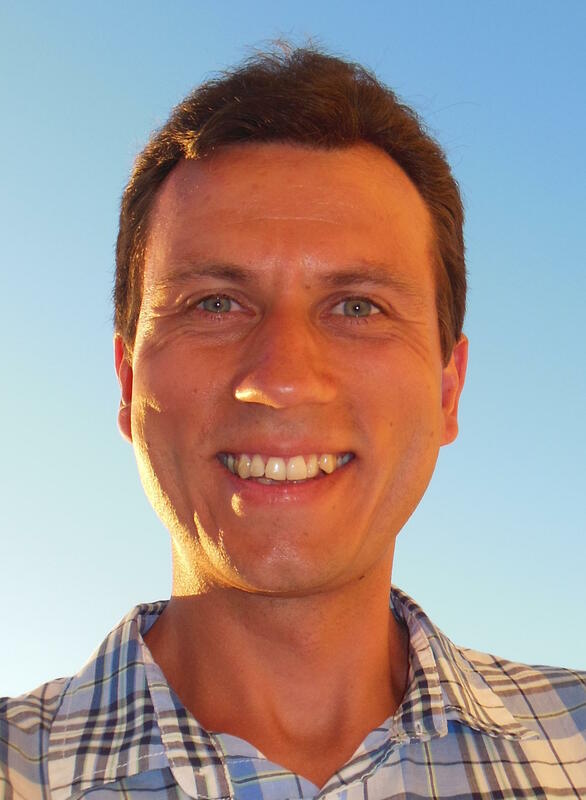 Vitaliy Kurlin on Can you detect an Atmospheric River? 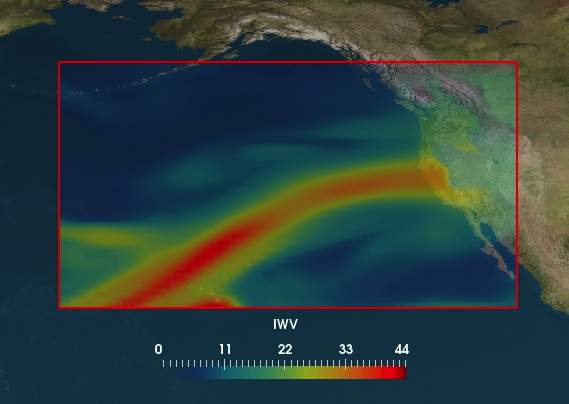 Aviral on Can you detect an Atmospheric River? Janet on Can you detect an Atmospheric River?